It’s a given that the first movie release of any calendar year (and we’re talking about films actually released in the new year and not those given limited end-of-year award-eligibility releases that open wider after January 1) is usually a total turkey. And, by all rights, Escape Room, a film that’s based on a glorified game concept played in large enclosed areas, should fit that mold. After all, the producers even changed its name from The Maze (and presumably did some script polishing as well) to appeal to the gamer demographic. But, somewhat surprisingly, while Escape Room won’t be mentioned come Oscar time, it also won’t be “honored” by the Razzies the night before. In a real-life escape room, a group of people pays a ridiculous amount of money to be locked in a room for an hour or so and try to figure the way out. They do so by guessing the meaning of various clues that are hidden around the room, the solving of which eventually leads to finding the key or other method of egress. If the players get stumped, time runs out eventually, and the host tells them they’ve lost (and what grim fate awaits them) and explains the meaning of the clues. Some fancier escape rooms comprise multiple individual rooms from which the players must escape, one after another. That’s real life; in reel life, the penalty for not getting out of a room is far worse than possibly feeling stupid or embarrassed. In Escape Room, players who don’t get out exit the film rather permanently. The movie actually begins with a flashforward showing one player trying to figure out being squashed flat by the rapidly contracting walls of a room. After that, the film goes back in time three days to the beginning, when six players receive mysterious invitations to an escape room weekend. For a variety of reasons, mostly because they have nothing better to do, they accept. The six are the usual group of zero, one, and two-dimensional characters found in films like that. First, there’s an alpha male hotshot stockbroker, Jason (Jay Ellis). Then, there are the shy college genius with no social life, Zoey (Taylor Russell), and the highly stressed war vet who’s sporting some nasty burn scars, Amanda (Deborah Ann Woll). Finally, there are the screw-up loser Ben (Logan Miller), the gamer geek Danny (Nik Dodani), who conveniently supplies exposition on the workings of the game, and the middle-aged nice guy Mike (Tyler Labine). No sooner do they meet and exchange a handful of pleasantries at what they think is the reception area for the game company then they learn that the reception area is, indeed, the first room in the game. And, as they look for clues, burner jets in the ceiling turn on, turning the room into a giant oven-in-the-making. And, as an understandably perturbed Amanda soon realizes, the peril is real. And that’s pretty much the plot of Escape Room. The group figures out a way to get out of one room and wind up in another, occasionally losing a member or two along the way. There’s a bit of eventual camaraderie and occasional bickering, and, finally, most of them reveal a big inner secret about themselves that is tied to the theme of one of the rooms. Some of the characters will turn out to be nice guys and gals, and some real jerks, and you can probably already guess which will be which and who’s probably going to be around until the end. There’s no Laurie Strode hanging around in Escape Room, and there’s no Michael Myers either, Worse, for a film that desperately wants people to think it’s a hipper version of Saw, there’s no Jigsaw John character behind the various death traps. The script does explain what’s going on, eventually, although many people will probably have already guessed the escape room’s purpose. And, while a human villain does finally appear, he or she (I wouldn’t spoil this) is a most underwhelming screen presence. 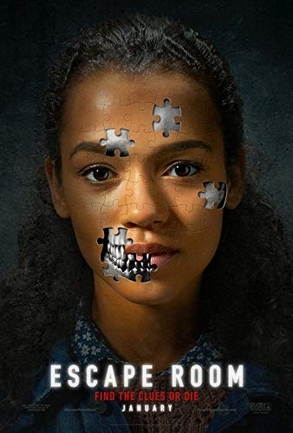 Further, for those who enjoy real-life escape rooms (probably a good bit of the movie’s target audience) and want to figure out the clues along with the characters, the rapid pace and choppy editing style make it difficult to do so. Indeed, although Escape Room is billed as a horror film, there’s no horror at all in it. The PG-13 rating ensures that there’s no blood or gore (in this case, literally), and director Adam Robitel pretty much telegraphs every remotely creepy moment well in advance. But while Escape Room falls short as a horror film (and, indeed, as almost any other sort of film), it is reasonably successful at generating suspense, thanks to some skillful production design. Escape Room shares the same attention to production detail that goes into films like the Saw franchise and the Final Destination films. Namely, in the better sequences (and some of the sequences don't work), each detail of the design, like each feature of the game, figures into whether the characters will make their way out of the room. In the very first scene, a partially empty water cooler plays a crucial role in allowing the characters to escape. By far the best sequence, however, is the so-called upside-down room (shown in the clip below), a scene that recalls the original Poseidon Adventure in several ways. The characters are stuck in an upside-down bar with Petula Clark’s “Downtown” blaring away on the jukebox as ceiling (floor) panels progressively fall away, revealing a multi-story death drop underneath. It also helps the suspense that one of the more sympathetic characters plays the central role in this scene. I was impressed that the filmmakers didn’t merely fall back on making another version of Saw and actually paid some attention to detail (although, as usually happens, on closer inspection, the plot proves as full of holes as the upside-down room floor). And I did like the outside-the-box thinking one character eventually used to get ahead of the game. As a TV-movie on a basic cable channel like SyFy, Escape Room wouldn’t be a bad way to spend an evening, especially if the audience can ignore the cardboard characters and predictable wrapup. However, as a theatrical release, it just doesn’t provide enough of an escape. In this clip, the group find themselves in an upside-down room.